A couple nights ago, instead of going to bed like I should, I was savoring the quiet of the (obscenely) late hour when the habitual tic came upon me. To check my Newsfeed. Like opening the fridge door to see if anything worthy magically appeared since the last time I checked. My scrolling expedition yielded this article by Ruth Graham. Ms. Graham writes from the perspective of a childless woman who hopes to have kids one day, feeling inundated by the excessive updates and tweets on social media about the woes of parenthood. She doesn’t want to be scared off by all these status updates making parenting sound like Guantanamo. She wants to believe in the magic of it all. Chile, please. If status updates can scare you off, you ain’t ready. I feel more of a connection to someone when they deviate from the easier, more superficial stuff and share from the heart, particularly the messy stuff of life, including parenting. These days, Facebook has become more about sharing articles, memes, Internet quiz results (so many quizzes! ), and pictures of food, but for me, as a stay-at-home mama, it’s also the “place” I look to for some connection with other adults. People’s lives are so much more interesting and REAL when presented in three dimensions, not limited to “look where we went,” “look what we ate,” and for fellow parents, “look at yet another picture of our little cherubs,” though I am definitely guilty of that last one. I love it when photos are sprinkled with what you’re thinking or feeling on any given day. Some editorial, please. Naturally, everyone has different comfort levels when it comes to sharing, like those who only use social media passively, scrolling through their Newsfeed, Liking and commenting here and there, but not feeling a need to update, not really looking to Facebook as a community, per se. Or many who are concerned about privacy issues so they prefer to just spectate. That’s fine, to each his own. However, sharing only the photogenic moments can often do our Facebook friends a disservice, as there is a comparing of lives, albeit subconsciously, that we all do with each other when we share only our shiny, happy, blemish-free moments. Particularly, when we’re struggling in a certain area of our lives, in the more downtrodden moments, we succumb to envy (at least I do). The seemingly happier marriages, the fatter wallets, the bigger/cleaner homes, the exotic vacations, the angelic, well-behaved children, whatever you’re yearning for at the moment, Facebook will offer a smorgasboard of lives to compare yours with. You don’t MEAN to do it but it happens. So it’s reassuring when we can share on a deeper level from time to time, about what we’re yearning for or what we’re pondering on. Or what we’re struggling with, like the tough moments of parenthood. Despite my own attraction to hearing from the trenches of any experience, one thing I have noticed is that there is a trend towards irreverent parenting that rubs me the wrong way. Magnifying and trying to profit from sharing the crappy parts of parenthood: Cursing gratuitously, making too many jokes about desperately needing those boxes o’ wine, pretending that they are somehow “above” the rest of us boring, domesticated parents by being snarkier than ever. The Too Cool For School syndrome. I’ve stumbled across a few Mommy (and Daddy) blogs whose primary goal is to be viewed as a hip and hilarious parent, even mocking their own kids for a laugh. I hope I don’t ever come across that way as I do share a lot of my life. I don’t mean to ever mock my children. That stuff is completely different from genuinely and earnestly sharing your life – the highs and the lows. And while parenting is full of joy, there is a lot of tedium and heartache and pressure (I’m talking mealtimes alone). And then there’s the polar opposite on the parenting spectrum. Those who feel compelled to ONLY share the positive stuff. But that is only a sliver of real life. Not that we have to post pictures duking it out with our significant others or actual tantrums (adults’ and toddlers’). I like the middle ground. Sharing the shiny, happy stuff, sprinkled with some of the grit. Made me think about how just one day as their Mama is full of shiny, happy stuff, sprinkled with some grit. And on a few of those days, more like a whole lot of grit, sprinkled with some shiny, happy stuff. Ignoring, resisting, laughing at Mommy’s expression, pushing Little Bro down while running away from me, more resisting, then finally my wrangling him into a Timeout. I, of course, step on an assortment of hard fake food pieces on the way to fetching him for a pee clean-up in the bath, feeling clammy and faint from the same cold that all three of us are battling, and dread lunchtime, at the rate things are going. 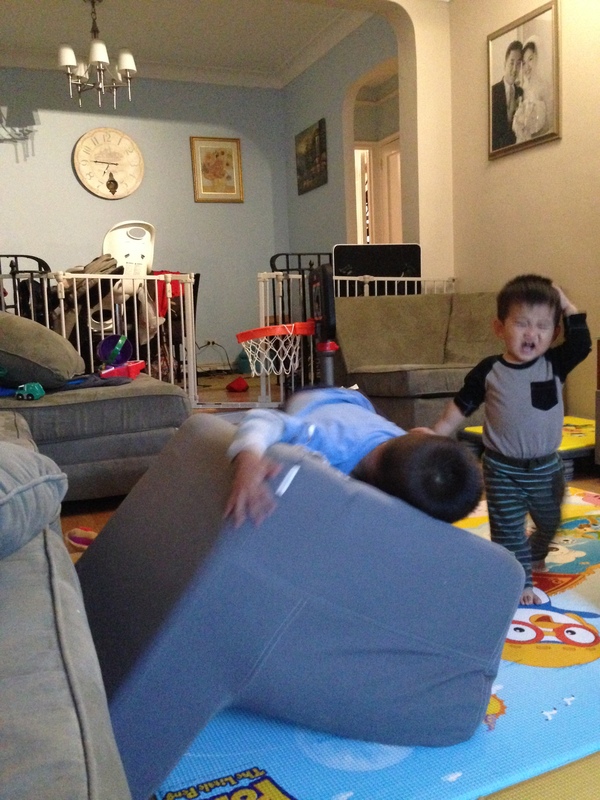 And when things calm down with Big Bro, Little Bro decides to giddily run the entire length of our long couch, only to faceplant on the one square of wooden floor that is NOT covered by a playmat. Often, it’s not circumstances that get the best of me. It’s how I’m doing emotionally and mentally when these circumstances pile on top of each other, including this very long stretch of polar vortex winter. 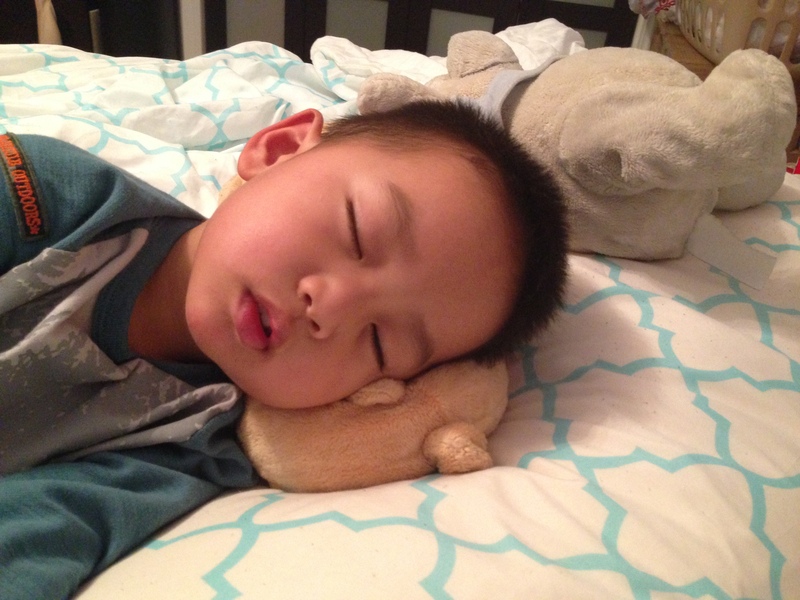 But then, that same afternoon, when Micah and I are snuggling, I name the three friends he chose to bring along from his huge entourage of stuffed animals that I’m so tempted to discard while he sleeps (too many to launder each week, too much of a germ-magnet). “Ellis is sleeping so can we please not go get the Mommy? You mean that Dragon doll? That’s Mommy, right? But you have the real Mommy right here so you don’t need Dragon Mommy.” (I really didn’t want to get up to fetch one more thing). And boom, just like that. I feel the weight and honor of my three year-old’s statement. Just when I think I’m really phoning it in on days like this, my dude tells me that there is no family without Mommy. I sneak into their room and get Lion for him. As soon as Lion joins, he falls asleep on the couch, clutching all four animals so tightly, making sure all of them are in his arms. Or when these guys literally pull each other off of Mommy so that they can be the sole beneficiary of her snuggles? Thank you to both my sons for making my (retired) immature fantasies of a guy relentlessly pursuing me to the point of obsession come true. Micah runs out of his room and chimes in, “Go to sleep now, Daddy. You have to sleep NOW! Right here by my door so I can watch you sleep, my Daddy.” (Both our hearts melt, though Daddy is about to keel over after an especially active Saturday). When I’m older and greyer, these heart-tugging memories will outlast the memories of being bone-tired and wiped out. So don’t be scared off by our sharing of lives, Ms. Graham. There is still so much magic left in parenthood that my uterus twinges just typing this. BUT, let it also be known, the tough stuff of life, including this crazy, incredible ride called parenting is so very real, thus making this family seriously consider putting up a Closed sign on this here noble uterus for good. Magic – check. Reality – check. what time is Daddy getting home again? This entry was posted in from the parenting trenches, musings and tagged the magic and grit of parenthood by ajummama. Bookmark the permalink. Did you know that the woman who made “drinking moms” famous (she had a book something about chardonnay and sippy cups,)–She ended up going to rehab, because she realized she was an alcoholic! Whenever I see people posting about booze what I would consider excessively, I always think about all the times that they’re drinking but NOT posting about booze. I am going to send you a message on FB–check your other folder because that’s where it will probably end up.